Whether you’re starting a new business or giving your existing business model a second look, it’s imperative to have a clear vision of where you are and where you’re headed. If a successful business can be considered a destination, then a clear and accurate roadmap would be a necessity in order to find your way there. This doesn't just go for tech-focused projects--rather it's useful for every kind of new project. The Business Model Canvas is that road map. It was originally proposed and developed in 2008 by Alexander Osterwalder, based upon his 2004 thesis: The Business Model Ontology – A Proposition in a Design Science Approach. Since then, a variety of canvasses for specific business niches have been developed. These nine elements encompass each of the most important considerations in developing a successful business plan. They are: Key Partners, Key Activities, Key Resources, Value Propositions, Customer Relationships, Channels, Customer Segments, Cost Structure, and Revenue Streams. These elements, taken together provide a clear window into the key drivers of your business. 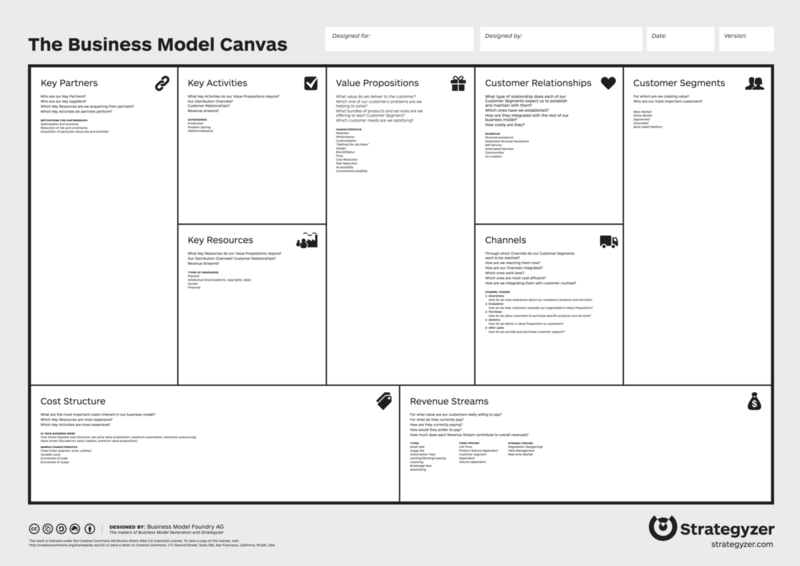 The Business Model Canvas stands in contrast to the traditional business plan that can encompass endless pages of tedious information. Filling out this canvas completely and thoughtfully is an important step in creating or fine-tuning a succinct, easily understandable business road map. It’s a map that you and your partners and employees can easily refer to and tweak as real-world considerations inevitably alter your original course. When you first dive into your Business Model Canvas, the most important consideration is flexibility and an open mind. Create a copy of the canvas on a white board and then brainstorm. This format will allow you to more easily delete and rearrange elements as you fine tune your model. Clearly identify your customers. Identify their behaviors. What do they want. What do they need? Where do they live? What do they do? What do they think? What existing need do they have that your product can fill? What alternatives do they have to fill those needs? Remember, customers aren’t only the end users of your product. If you’re a web presence, you may also have advertisers to consider. Is your product sold in stores? Consider buyers as another segment. Be careful to identify all aspects of your market. Each one will contain its own customer segment. Now rank these segments in order of priority. If you were only able to target one, which would it be? So, you’ve identified your customer segments and their needs. Now, how does your product or service meet those needs? What other alternatives do customers have, and why is yours better? Write them all down. Now rank them as best you can according to their importance to the customer. You may not think of them all, and your ranking may turn out to be wrong, but the important thing is to establish a starting point. The advantage of a Business Model Canvas is that it’s easily adjusted as real-world facts present themselves. Don’t worry about finding the definitive answers on your first try. Experience will teach you as you go. What’s the journey taken by your product to the customer? How do you promote it? Where do they find it? Do third parties sell it? Do third parties provide service after the sale? Think of every way in which your customers must be reached in order for them to become aware of, acquire, and be satisfied with your product or service. These are your channels. Are they all in place? Are they working? How can they be improved? How do you and the customer interact, and how does that differ depending upon the channel? It doesn’t matter that your product is the best alternative to all other providers. Poor communication can sour a customer relationship more quickly than nearly anything else. A problem with quality or availability or service can be overcome. But if there’s no one for customers to communicate with in order to resolve the problem, they’ll move on without a second thought. Simple. Where does your revenue come from? But don’t just list the sources of your revenue. You should also link those revenue streams to the customer segments and value propositions that generate them. These are the activities that are crucial to delivering your value propositions. What are the things you do to make everything else happen? Can you improve on these activities? Are there activities that have been neglected or overlooked completely? These are the strategic assets that must be in place in order for your business to compete. Ask yourself what things you need to be able to meet your customers’ needs. Which of these things are unique to you as compared to your competitors? Connect these resources to the key activities that are dependent upon them. Having completed the last two steps, you’ve now identified the activities and resources necessary to the operation of your business. This is the step in which you identify which of those are best established as your responsibility and which are perhaps best farmed out to partners who might have greater expertise or the ability to deliver them with greater efficiency. Different activities require different skills. It’s important to identify key partners to help with what you don’t do best so you can concentrate on your strengths. Finally, as with revenue streams, it’s important to identify costs and look at them in relation to how they align with value propositions. If you have costs that don’t relate to the items identified above, it’s time to evaluate the advisability of those costs. Study it. Apply it. Fine tune it. Share it with partners and employees. You’ll find that a succinct map of the elements listed above can be an invaluable tool in keeping key players on the same page and in driving the continued success of your business. Ready to move forward with your idea? Have you tried Builder yet? We’re here to help guide you through the process of creating your technology business or project from the ground up. Curious about the Cloud? We’ve got you covered there, too, with our CloudOps! Finally, stay tuned to our blog for more ideas, inspiration and tools to expand your ideas. Image thanks to Tirachard Kumtanom of Pexels.com.